There is a special type of llama that exists in small herds in certain regions of Argentina and along the border between Argentina and Chile. There are no alpacas in this whole region, so over hundreds of years the campesinos have bred these llamas for wool production as well as for meat. As a result the animals are robust and very wooly. They ususally have heavy bone and lots of lower leg wool even on the front legs. These llamas produce so much fine fiber that they look best and feel best when they are sheared each year. The campesinos of Argentina shear them to the skin in springtime, leaving only the lower leg wool, the tail and a ruff of wool around the face. 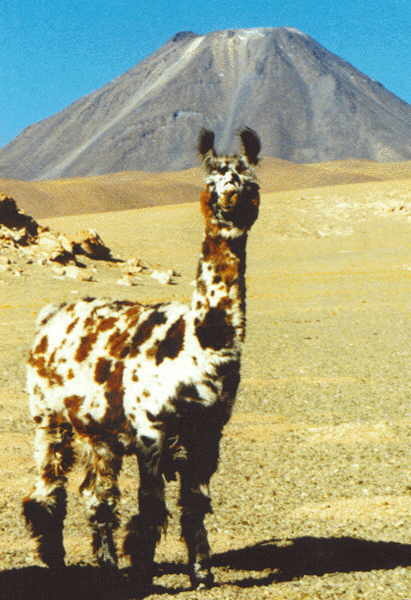 This type of llama can be found in a few places in Chile, too, and many of the 50 or so llamas imported by the Taylors from Chile during the past two years are of the Argentine type. Not all llamas in Argentina are what we are calling the Argentine type. In the far North of Argentina most of the llamas resemble those found in Bolivia. Sally, at 5'8", is dwarfed by this Argentine female.